Description: Fraunhofer IEE (new name since 2018; formerly Fraunhofer IWES) was founded at the start of 2009 from the merger of the former Fraunhofer Center for Wind Energy and Maritime Engineering CWMT in Bremerhaven and the Institute for Solar Energy Supply Technology ISET e.V. in Kassel. The research activities of the Fraunhofer Institute for Energy Economics and Energy System Technology IIEE cover the integration of renewable energies into energy supply structures in technical and economic regard. Description: The infrastructure for testing electrochemical systems comprises automated charging and discharging equipment, climate chambers, and the necessary measuring technology and safety technology. There is also a laboratory for testing fuel cell systems. These facilities are complemented by a development platform for virtual and multi-virtual electrochemical systems such as starter batteries and virtual lithium ion cells. Description: Test of battery modules and complete battery sets, PV modules, electrical devices and components. Description: Static and fatigue tests on full-scale rotor blades make it possible in a few months to predict the performance of a rotor blade, according to certification standards, over its 20 year life-span. Loads of up to 50 MNm are applied to rotor blades at various load points on a unique 70 m test stand. The application of the loads using hydraulic cylinders permits precise control of the loading. Fatigue testing is accomplished through cyclic loading at an eigenfrequency of the rotor blade, which provides an ideal load distribution along the blade. This is a fast testing method, with low energy consumption. Through measurement and frequency analyses, the rotor blade eigenfrequencies can be determined. Up to 250 strain gauges along with load cells, cable sensors, angle sensors and acceleration/temperature/humidity sensors provide a wealth of meaningful data. Description: DeMoTec mainly focuses on electrification with renewable energies using modularly expandable and grid-compatible hybrid power supply systems. Description: The MV grid simulator is a hardware model, which consists of three coupled transmission circuits. Overhead lines or cables can be simulated. Description: Contains two single phase PV inverters, three bi-directional battery inverters, with a battery bank. Description: The unit consists of a 32-kW-Diesel motor combined with a three-phase synchronous generator. The rated voltage is 400 V with 50 Hz. Description: The generators for wind turbines and combustion engines are asynchronous or synchronous. The simulator has both types of generators. These machines are powered by a high-dynamic DC motor. Description: SCADA system serving for the interaction of these components within an electrical network. Description: The simulator is forming the grid with the help of a synchronous machine, which is powered by a speed-variable direct current motor. Description: It consists of a direct current drive, which is supplied by a static inverter. In the drive is located an inertia rotor, which is representing the dynamic characteristics of the wind generator. Description: Two 700 W PV inverters and three bi-directional battery inverters with an output rated at 4.5 kVA. The maximum power of 13.5 kVA is available on a single phase. Description: The installed plant consists of a 20-kVA-Photovoltaic inverter and an uninterruptible power supply (UPS) with a rated output of 30 kVA. Description: Contains a 20 kVA PV inverter and a 30 kVA UPS unit. The PV inverter is supplied by the public net. A rectifier and a power controller simulate the typical PV characteristic. The UPS unit can be supplied by the PV inverter, the public grid or optional by a Diesel gen set. Description: Distribution System Simulator which consists of three interlinked transmission lines (overhead lines or cables, and three transformers 100kVA/10kV/0,4kV). It is possible to investigate transmission behaviour of the network on the medium voltage level by varying length of the lines and cables, varying loads and different kinds of operating conditions, as well as resulting influence on the devices, which are connected on the low voltage side. Description: The real-time version of the battery model ISET-LAB integrating the thermal behaviour, is controlling an electronic power source in order to simulate a lead battery. Description: Simulation tool for calculating loadflows in electrical networks. Description: Subsystem within DeMoTec: The mini-grid is formed by a single-phase battery power inverter. The current supply is made by two AC coupled PV inverters, connected with Photovoltaic generators. Description: Subsystem within DeMoTec: The three-phase plant consists of one phase PV inverters and of bi-directional battery inverters, connected on a 12 kWh battery bank. System back-up is provided by a diesel unit. Description: Subsystem within DeMoTec: For Studying the effects of the parallel operation of inverters from different manufacturers, an experimental test facility with over 20 different inverters has been installed. Description: Fraunhofer IWES develops converters for wind turbines, battery systems and other decentralized electricity generators. Several laboratories are available for the development of electronic circuits. In the laboratory for microprocessor and decive-oriented software technology, control circuits for converters can be developed using the hardware-in-the-loop and rapid-prototyping methods. The reliability of equipment can be tested in climate chambers and thermographically. Description: 30 MHz – 1 GHz, 3m accrediated, 10m precomplience, height variation 1m – 4m. Description: Fraunhofer IWES in Kassel carries out accredited tests in its laboratories in accordance with DIN EN ISO/IEC 17025. These are tests on the electromagnetic compatibility of electrical equipment, on the grid properties of converters for decentralized electricity generators (e.g. according to BDEW and FGW TR3), and on the efficiency of photovoltaic converters and systems. Description: In collaboration with the Eichhof Agricultural Training and Research Center, Fraunhofer IWES operates an experimental center for bioenergy system technology in Bad Hersfeld (Hesse). This covers the whole process chain from biomass production through to grid integration. A biogas test plant with a raw gas capacity of up to 50 m3/h is available for demonstration purposes and pilot plant trials. Up to 6 containers with test equipment can be provided. Experiments on biomass preparation, residue treatment, thermal biogas utilization, and gas upgrading and feeding are possible. Laboratories are also available for investigating specific biological, chemical, and physical parameters. Description: Several Fraunhofer IWES departments have brought together their know-how to create virtual development platforms for lithium ion batteries, charging units, and grid simulators in the new Test Center for Electromobility IWES-TPE. Based on an existing collaborative agreement with the University of Kassel, the collaborative work is being expanded via the Research Alliance for Vehicle System Technology. 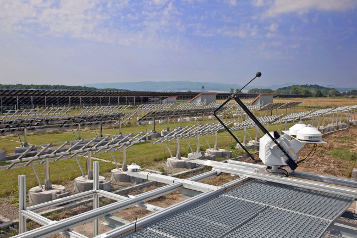 The focus of Fraunhofer IWES here is grid integration and the supply of renewable energies. The University of Kassel is focusing on the vehicle system technology. Description: A development platform for pitch control systems for rotor blades for large wind turbines is available in order to develop load-reducing control systems. The test stand permits realistic testing of three interacting, controlled pitch drives for individual blade pitch control. Near-real counter-moments are produced via real-time simulation of large wind turbines using synthesized inhomogeneous and turbulent wind fields. There is also a test stand for testing antagonistically controlled pitch drives which permits very low-load blade pitch control. Description: The cumulative loads at an offshore test site differ considerably from the loads on materials in laboratory tests. Materials are subjected to extreme conditions offshore: temperature fluctuations, increased UV radiation, exposure to seawater, biologically induced corrosion and mechanical loads. At four test locations – Wilhelmshaven, Sylt, Helgoland and at the mouth of the River Weser – materials and components are being tested under offshore conditions in order to acquire new knowledge about the long-term stability of sensor systems. As the environmental conditions at the locations differ, so do the damage profiles. Accordingly, customized strategies for protection are being developed. Sensors are being increasingly used in offshore wind turbines for recording material fatigue data. They can detect very small changes in the material structure and report these to the system. The results are used for validation and improvement of current laboratory test methods. Description: In outdoor test fields for photovoltaic systems individual modules and complete systems are measured over a long period in accordance with European guidelines for different manufacturers. Description: In its test centre for smart grids and electromobility, Fraunhofer IWES is developing and testing new equipment and operation strategies for smart low and medium voltage grids. In addition, investigations regarding grid integration and grid connection of electric vehicles and their power generated from renewable energy sources as well as photovoltaic systems, wind energy plants, storage and hybrid systems are carried out under realistic conditions here.A large open-air ground of approx. 80,000 m² offers sufficient space and very good conditions for solar and wind energy. Furthermore, the open-air ground provides configurable distribution grid sectors (low and medium voltage), as well as a route offering the possibility to test inductive charging systems for electric vehicles. Description: Fraunhofer IWES has since 1990 operated a Germany-wide network of measuring masts. The network currently comprises 30 masts. All the measuring stations are close to wind farms and are fitted with MEASNET calibrated anemometers. Besides the standard 30 m masts (for wind measurement at 10 m and 30 m heights), four 50 m masts have also been erected. These allow not only wind conditions but also other meteorological data to be recorded. The measurement data are recorded at a sampling rate of 1 Hz and are transferred hourly in 5 minute data sets to the data center in Kassel. In addition, Fraunhofer IWES operates three mobile LIDAR measuring units and these will be complemented this year by a 200 m high measuring mast. 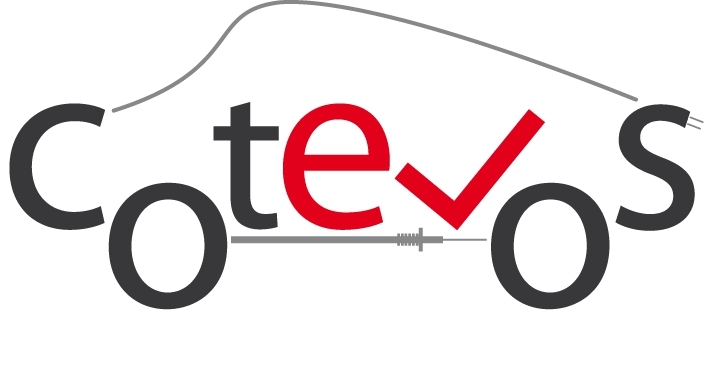 Quality Management: PV Inverter laboratory and SYSTEC are certified according to the ISO / IEC 17025.